Well I figure it takes all sorts in life, but I have to say that this latest app that can play on both the iOS platform and Android platform sure does take the biscuit, and not an app that personally I would want on my smartphone but there you go I’m that kind of guy, however some out there may well want to check out what is known as the Death App. According to the guys over at Ubergizmo, the strange people over at MobileNationHQ have created a web app they have called Death app, as part of a demo on how easy it is to create apps using their online app creator. Apparently the rather morbid Death app will work on Android handset and the iPhone and was made in eight hours, grave robbing and corpse carrying not requires one imagines. So what does the Death app do? No it doesn’t cause untimely death, but apparently those users with a morbid curiosity can find locations where recent deaths have occurred in the area, why anyone would want to know where people have died is somewhat beyond me. 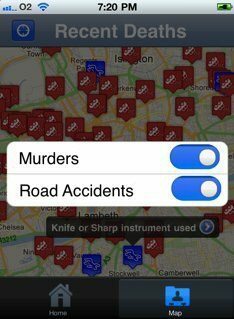 And just to appease you gruesome curiosity further, the Death app also delivers a description of what type of death it is, such as a car crash, murder or no doubt suicide, and marks the place of death on a map, probably so you can go visit where someone kicked the bucket. Apparently deaths can be searched by type of death or location, just in case you are actually attracted to a particular type of victim no doubt so you can cater for your personal morose tastes. However apparently there is an upside to the Death app as is can help cyclists and pedestrians be aware of their surroundings such as a vehicle accident prone area, probably so they don’t become one of the deaths the Death app records in future. For those of the dark that would like to indulge their curiosity and check out the Death app on their mobile phone they can scan the QR code for the app with your handset from Here. If you do happen to try out the Death app and by any chance find it useful other than abating your grisly curiosity with death, then feel free to let us know your opinions on said app by posting to our comments area below.